If you want to give your skin a radiant, sun-kissed look, you will definitely love this versatile Oriflame sun-liner, to shade , shade and brighten your face. Get a natural tan effect in any situation and any time of year! A duo in one package. Suntan and highlighter that allows highlighting the face shapes. It can be used in layers until it reaches the tone you want. Smooth texture and easy to apply. Contains Halolight Technology ™ for subtle lightness and a healthy glow. Multibenefits – we treat you! Gradual finish for a golden glow or a deep tan look. 1. Model the face applying suntan from the temples to the cheekbones. 2. Apply light to the inner corners of the eyes, below the eyebrow and on the upper part of the cheekbones. 3. Apply the illuminator on the nose shaft and on the top of the upper lip. Remember to spread well for a lightly tan touch. Have that lightly tan look whenever you want. 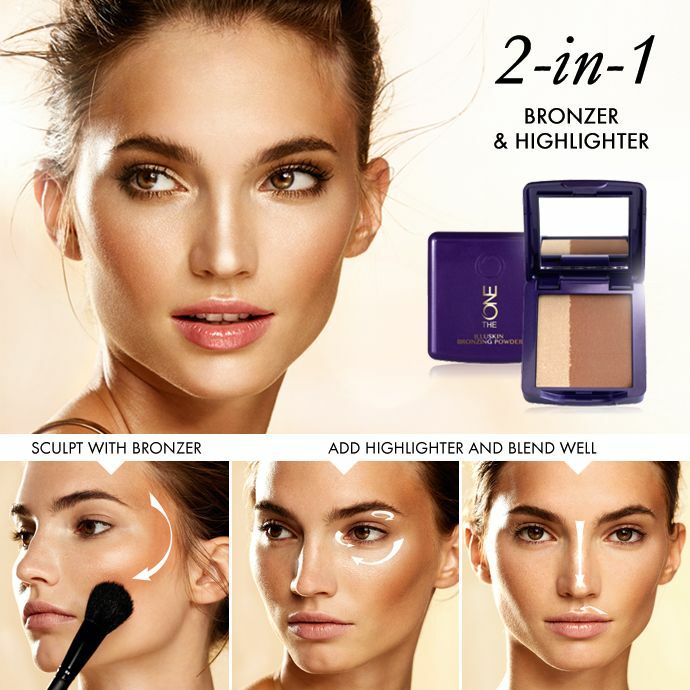 Versatile tan duo with darker shade to contour and lighter shade to illuminate, in a soft powder. Use the tones together or separately for the perfect summer brightness all year round. 8 g.